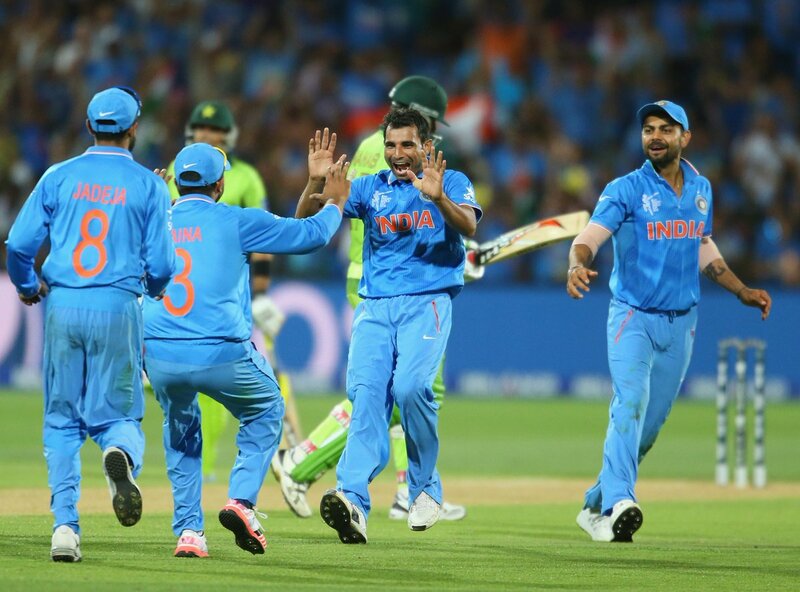 India had won all their previous five meetings against Pakistan in the World Cup and it was no different on Sunday as the defending champions defeated their neighbours by 76 runs to take the advantage to a perfect tennis scoreline of 6-0 against their rivals in the tournament. India once again came out on top in the high-octane clash to defeat Pakistan in their World Cup opener at the picturesque Adelaide Oval. A special century by vice-captain Virat Kohli (107) guided India to 300/7 which Pakistan failed to chase down, being bowled out for 224 in 47 overs. Winning the toss, M.S.Dhoni’s boys preferred to bat first and set up a taxing total for Arch-Rivals Pakistan at the Adelaide Oval. 13pt number of crowds turned up to support both the teams and the stadium atmosphere and spirit reminded some of the Eden Gardens back in India. The strong Indian line up was triumphant in exerting influence on their opponents. The early departure of Rohit Sharma (15) put some pressure on the Indians, but this time opener Shikhar Dhawan displayed his magnificence by hamering 73. Runs of 76 balls which included 7 fours and a six, which gave India a platform to put a big total on the board. Dhawan soon become the victim of Misbah Ul Haq during the 30th Over and was run out. The departure of Dhawan led to the emergence of Suresh Raina who proved a helping hand for Kohli so that they could together craft the innings to reach 300. Kohli once again proved his worth under pressure and contributed to a 107 to India’s total. Kohli was given a life by Yasir Shah and was given a second chance by Umar Akmal at 76. Dropping a catch of India’s crucial man Kohli gave Pakistan jitters. The aggressive Delhi Lad took the bowlers to the cleaners and achieved his 22nd Century. The Indian innings collapsed after the retreat of Raina who also smacked at wonderful knock of 74 runs. India crawled to 300 at the end of 50 overs. Pakistan looked steady at the start despite losing experienced batsman Younis Khan (6) cheaply in the fourth over. Opener Ahmed Shehzad (47) and Haris Sohail (36) were batting brilliantly till 79/1 in the 18th over when the latter edged one to Raina in the slips. Soon the three important wickets of Ahmed Shehzad, Sohaib Maqsood (0) and Umar Akmal (0) in the span of eight deliveries turned the match in favour of the two-time World Champions. Suddenly from 102/2, Pakistan were Wobbling at 103/5. The Pakistani lower order could not provide much of a fight and the only person in between India and their victory was captain Misbah-ul-Haq (76), who scored his 39th half-century. He kept running out of partners and was eventually caught at mid-wicket in the 46th over. Pacer Mohammed Shami was the gem of the Indian bowlers as he notched up 4/35 from nine overs while spinner. Ravichandran Ashwin's (1/41) brilliant spell, which included three maidens, slowed down the Pakistani innings. An India-Pakistan match is surely a treat to watch for the fans from both the country’s and is much more than a game for them, it involves the pride of their nation. Being arch-rivals from time immemorial, there must have been added pressure on both the teams. “Adversity causes some men to break, and the others to break records” was clearly shown in this case. The Indians thrived under pressure and emerged with several positives and as a stronger side who seemed to have learnt from their mistakes. On the other hand, pressure got the better of Pakistan and crumbled them. India dominated Pakistan throughout the game and the Indian fans would be happy as their team performed well in both the units. The return in form of Raina and Dhawan gave some relief to the captain as they can now be India’s back up cusion provided any of the others fail to perform. Kohli, who did not seem in good touch with his bat since the Test series ended, showed how valuable he is for his team when they require him the most. He also became the only Indian to score a ton against Pakistan in the world cup. It’s one achievement after another. India’s bowling unit also displayed their qualities and handled the game very well giving India the timely wickets they have been searching for since ages. They were able to put pressure on Pakistan and also did not concede too many runs. Pakistan in reply came back strongly taking 5 wickets and restricting the defending champions to 27 runs in the last 5 overs. Pakistan’s batting order lacked consistency and their bowling unit gave In too many runs to the Indians. Only Captain Misbah-Ul-Haq looked dangerous. While Pakistan will have to forget the past on move on into the future with a positive mindset into their upcoming game vs West Indies on Saturday. India should be glad of the positives, but not be over-confident as they take on the Africans on the 22nd of February. India get the bragging rights over their rivals, can they go on to win back-to-back World Cups? 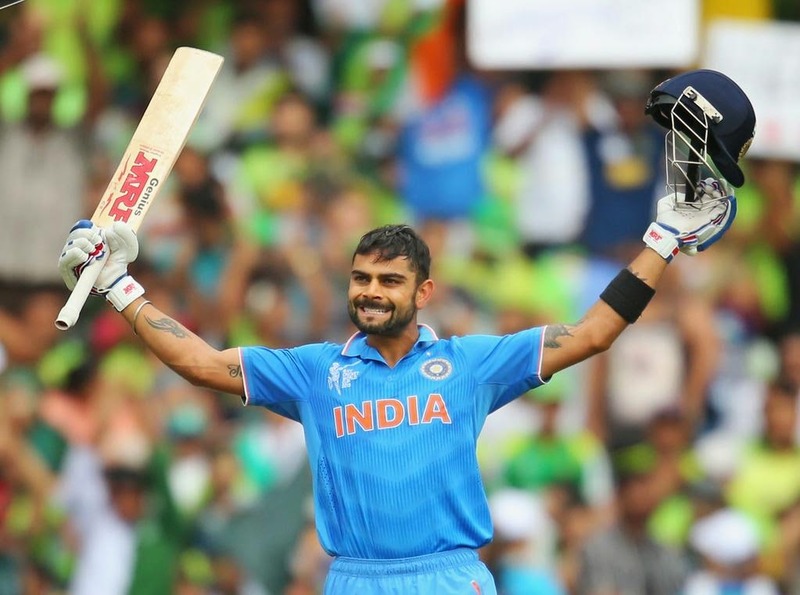 Virat Kohli's century proves the cornerstone of India's 76-run victory over Pakistan.